The Bible teaches that there is more than one tabernacle or sanctuary. There is the earthly tabernacle which the Lord instructed Moses to build and there is the Heavenly Sanctuary which God made. The apostle Paul wrote: "Now of the things which we have spoken this is the sum: We have such an High Priest, who is set on the right hand of the throne of the Majesty in the heavens; a Minister of the sanctuary, and of the true tabernacle, which the Lord pitched, and not man." Hebrews 8:1–2. John also saw this sanctuary while in vision on the isle of Patmos: "And the temple of God was opened in heaven, and there was seen in his temple the ark of his testament: and there were lightnings, and voices, and thunderings, and an earthquake, and great hail." "And after that I looked, and, behold, the temple of the tabernacle of the testimony in heaven was opened:"
The apostle Paul, in the Epistle to the Hebrews, says: "Then verily the first covenant had also ordinances of divine service, and a worldly sanctuary. For there was a tabernacle made; the first, wherein was the candlestick, and the table, and the shewbread; which is called the sanctuary. And after the second veil, the tabernacle which is called the holiest of all; which had the golden censer, and the ark of the covenant overlaid round about with gold, wherein was the golden pot that had manna, and Aaron's rod that budded, and the tables of the covenant; and over it the cherubims of glory shadowing the mercy seat." Hebrews 9:1-5. Turning again to the book of Hebrews, the seekers for truth found that the existence of a second, or new-covenant sanctuary, was implied in the words of Paul, "Now of the things which we have spoken this is the sum: We have such an High Priest, who is set on the right hand of the throne of the Majesty in the heavens; a Minister of the sanctuary, and of the true tabernacle, which the Lord pitched, and not man." Hebrews 8:1, 2. The term "sanctuary," as used in the Bible, refers, first, to the tabernacle built by Moses, as a pattern of heavenly things; and, secondly, to the "true tabernacle" in heaven, to which the earthly sanctuary pointed. At the death of Christ the typical service ended. The "true tabernacle" in heaven is the sanctuary of the new covenant. And as the prophecy of Daniel 8:14 is fulfilled in this dispensation, the sanctuary to which it refers must be the sanctuary of the new covenant. At the termination of the 2300 days, in 1844, there had been no sanctuary on earth for many centuries. Thus the prophecy, "Unto two thousand and three hundred days; then shall the sanctuary be cleansed," unquestionably points to the sanctuary in heaven. What was done in type in the ministration of the earthly sanctuary is done in reality in the ministration of the heavenly sanctuary. After His ascension our Saviour began His work as our high priest. Says Paul: "Christ is not entered into the holy places made with hands, which are the figures of the true; but into heaven itself, now to appear in the presence of God for us." Hebrews 9:24. For eighteen centuries Christ's work of ministration continued in the first apartment of the sanctuary. The blood of Christ, pleaded in behalf of penitent believers, secured their pardon and acceptance with the Father, yet their sins still remained upon the books of record. As in the typical service there was a work of atonement at the close of the year, so before Christ's work for the redemption of men is completed there is a work of atonement for the removal of sin from the sanctuary. This is the service which began when the 2300 days ended. At that time, as foretold by Daniel the prophet, our High Priest entered the most holy, to perform the last division of His solemn work--to cleanse the sanctuary. The subject of the sanctuary was the key which unlocked the mystery of the disappointment of 1844. It opened to view a complete system of truth, connected and harmonious, showing that God's hand had directed the great advent movement and revealing present duty as it brought to light the position and work of His people. They had expected Him to appear in glory to give reward to His servants. As their hopes were disappointed, they had lost sight of Jesus. Now in the holy of holies they again beheld Him, their compassionate High Priest, soon to appear as their king and deliverer. Light from the sanctuary illumined the past, the present, and the future. Please see Hebrews 8, 9, and 10. Says the prophet: "Who may abide the day of His coming? and who shall stand when He appeareth? for He is like a refiner's fire, and like fullers' soap: and He shall sit as a refiner and purifier of silver: and He shall purify the sons of Levi, and purge them as gold and silver, that they may offer unto the Lord an offering in righteousness." Malachi 3:2, 3. Those who are living upon the earth when the intercession of Christ shall cease in the sanctuary above are to stand in the sight of a holy God without a mediator. Their robes must be spotless, their characters must be purified from sin by the blood of sprinkling. Through the grace of God and their own diligent effort they must be conquerors in the battle with evil. In the Bible Investigations are nothing new, time and time again God investigates places and people before pronouncing His judgments. Below are just a few examples. In Genesis chapter 3, verses 9–13, God asks Adam and Eve questions and then pronounces a judgment in verses 14–19. In Genesis chapter 4, verses 9–10, God visits Cain and asks him about his brother and then pronounces a judgment in verses 11–12. In Genesis chapter 11:5–6 God visits the tower of Babel and the judgment of confusing their language occurred in verses 7–8. 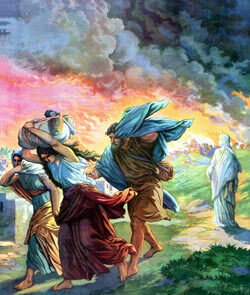 In Genesis chapter 18:20–21 we read that God intended to visit Sodom and Gomorrah before pronouncing His judgment up them. The work of examination of character, of determining who are prepared for the kingdom of God, is that of the investigative judgment, the closing of work in the sanctuary above. The passing of the time in 1844 was followed by a period of great trial to those who still held the advent faith. Their only relief, so far as ascertaining their true position was concerned, was the light which directed their minds to the sanctuary above. As they waited and watched and prayed to know the will of God they saw that their great High Priest had entered upon another work of ministration, and, following Him by faith, they were led to see also the closing work of the church. They had a clearer understanding of the first and second angels' messages, and were prepared to receive and give to the world the solemn warning of the third angel of Revelation 14.